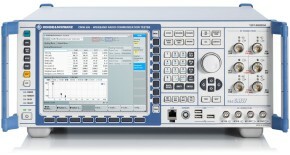 Most of the HSDPA tests specified in the TS 34.121 for 3GPP Release-5 / -7 and -8 can be performed with an R&S®CMW500. This document provides a step-by-step guide on how to use a stand-alone R&S®CMW500 to perform HSDPA Tests (from Rel.5 up to Rel.8 / DC-HSDPA+) measurements on transmitter characteristics and receiver characteristics in line with TS 34.121 V9.5.0, clauses 5 and 6. A set of save files based on R&S®CMW500 firmware V3.0.10 for user equipment supporting Operating Band I with Power Class 4 is attached to this application note for easy recall of important settings while performing tests in line with the relevant specifications.